Halloween was skipped this year. Not on purpose, but Christopher and I found ourselves on a flight crossing coasts on the 31st. By the time we landed and arrived home, there was just enough time in the day to stare at the tv and zonk off to sleep due to jetlag. When I woke up it was time for Thanksgiving. So, naturally, I need to start thinking about Christmas RIGHT NOW. I’m using this month’s Mixology Monday, hosted by the Booze Nerds, to do just that; think about winter holidays. The theme picked this month is “Resin”. What, you may ask yourselves, is that all about? You can read the full post on their site here, but mainly it’s using SAP (from Trees, not the accounting program). My eyes drifted over in the direction of the front of my house, which is covered with rosemary plants. The likes of which you’ve seen as ingredients in my drinks here here and here. 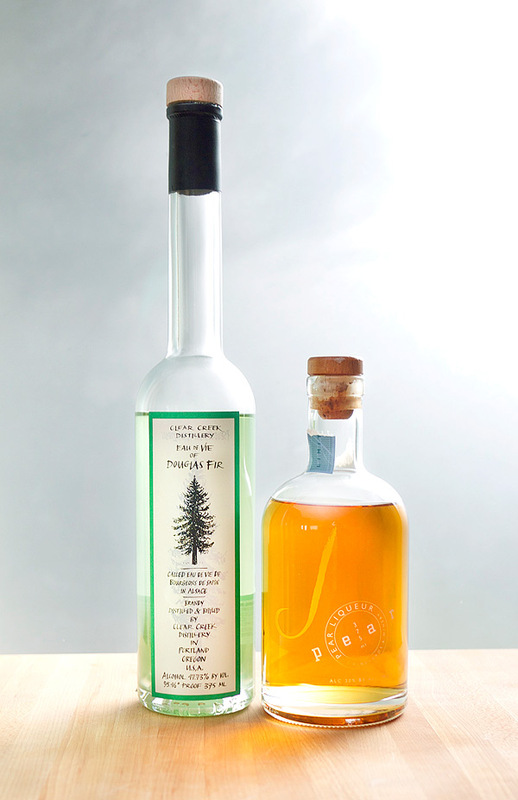 This month, rosemary is strictly a garnish as I bring out another beauty of the deciduous kind, Douglas Fir Eau de Vie from Clear Creek Distillery. I saw this on the shelf at a liquor store and picked it up for the sheer fact that I LOVE LOVE LOVE the smell of fir trees (i.e. Christmas Trees). This probably falls in at #3 on my list of favorite smells, which is a list that I have. Pears are replacing apples right now as the seasonal fruit and I thought that a pairing of pear and fir tree is about as winter holiday of a cocktail as I can pull off right now. Adding cardamom also helps. And it works for the MxMo challenge. Combine pear cubes and cardamom seeds in the bottom of a mixing glass. Add lemon juice and muddle well to full combine and break down the pear. Next add in ice about 2/3 up the way of the mixing glass. Pour in vodka, pear and fir eau de vie. Shake to fully combine about 20 seconds. Double strain into a chilled cocktail glass. Top with a pear wheel skewered with the rosemary sprig. Strong rosemary and cardamom nose with sweet, lemony notes. Flavor is juicy pear with a nice balance of tartness from the lemon. 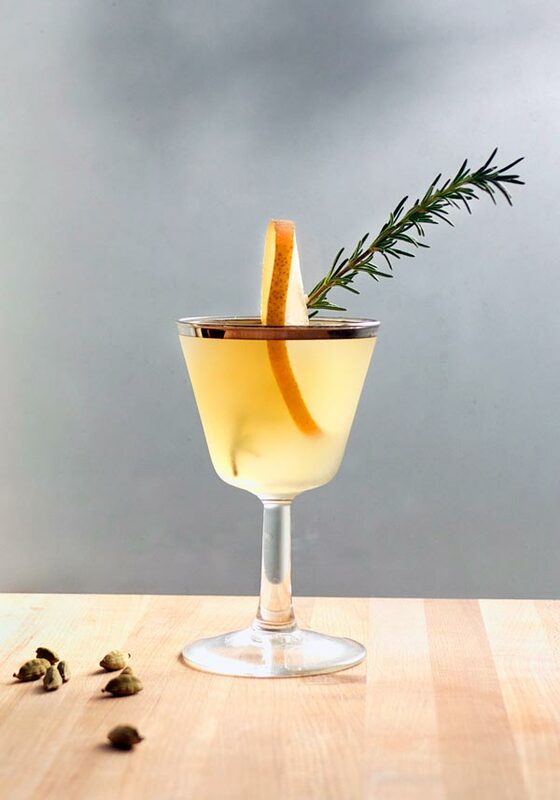 The presence of the fir is not subtle, as it stands out next to the pear, but it also compliments the sweetness by offering an unexpected earthiness and woodsy layer to the drink. Thanks to the Booze Nerds for this month’s MxMo challenge and for making me break into this bottle, it was a delicious experiment and kinda like drinking a Christmas Tree. *This bottle of Chopin was generously given gratis and appears here because I like drinking it. For more info on sponsored products, affiliate links, and gifted booze, please visit the About page. Previous Post: « Holiday Gift Guide: Cocktails. On a Boat. You busted out the fir eau de vie! Awesome. And the drink looks delish. Thanks so much! That stuff is pretty amazing. Who lights your shoots?!? g-dman! Does Christopher just hang from the ceiling and smiles down onto them while you take these pictures? Nope. This is just some winter light and a low shutter speed. ummm….yeah that was meant to say ‘goddamn’ but for some reason ‘g-dman’ came out which I feel is even more offensive… Glad we settled that. You’re welcome! You have to say it like Uma Thurman in Pulp Fiction doing lines of coke. Yes, yes, and…….yes Elana!! You owned this drink. And such beautiful ingredients. I’ve been wanting to use the Douglas Fir Eau de Vie so badly. I might have to copy you 😛 Well played. Thanks Todd! And it’s a deal. I’m totally stealing your foam idea. I just stumbled across your blog and I am so glad! I’ve been looking for some fantastic winter drink recipes that are different than my go-tos, and this looks amazing. Awesome!! Hope you like it. How no to love your photos?